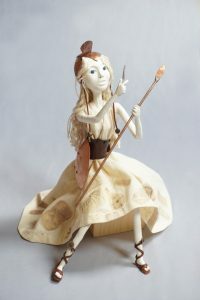 “Athena Sharpening Spear” is my latest art doll creation. This figure sculpture is a look backward and forward in media choices. She incorporates quite a bit more copper than I’ve included in recent pieces. The metal elements this time are found in her clothing and armor, not her face or hands like many of my earliest art dolls. I chose to sculpt the doll form itself from paperclay. I like how the plain sealed clay lends her the look of carved alabaster. Small details like toes in shoes clad in sandals are more effectively achieved in this media, as are the position of her hands gripping the spear and file. Ironically, this sculpture pulled from ancient Greek mythology is inspired by current events. It can come as no surprise that an artist who was once a science educator finds anti-science and anti-education trends to be alarming to say the least, and completely infuriating if I’m being quite honest. 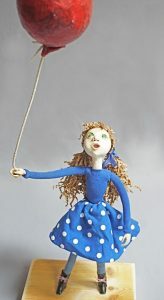 The mood tends to not be fertile ground for light happy doll synthesis. So, my Athena is not the traditionally depicted serene goddess standing proudly, and ready to provide inspiration. Instead, Athena is seated, looking looking attentively to her task, and readying herself for battle. Her dress is imprinted with symbols of learning and knowledge. I found editing these images to be one of the more challenging elements of design. What does one choose to depict knowledge and wisdom? I pulled from many sources and disciplines. I made a conscious choice to end with things prior to the 20th century. The technological explosion past that point simply overwhelmed me with choices. Likewise, I made a design decision not to flip images containing text horizontally before printing on the transfer media. I like that all the sources in different languages, alphabets, and scripts are slightly unreadable. In this way they serve as symbols of the knowledge they contain, rather than specific editorial choices on my part. I mentioned Athena in some writing that was needed for early publicity materials for our yearly featured artists shows. Because of this, she will be hanging around the studio until my show opens during the last week of June. This entry was posted in Uncategorized on March 4, 2017 by lynnadmin.